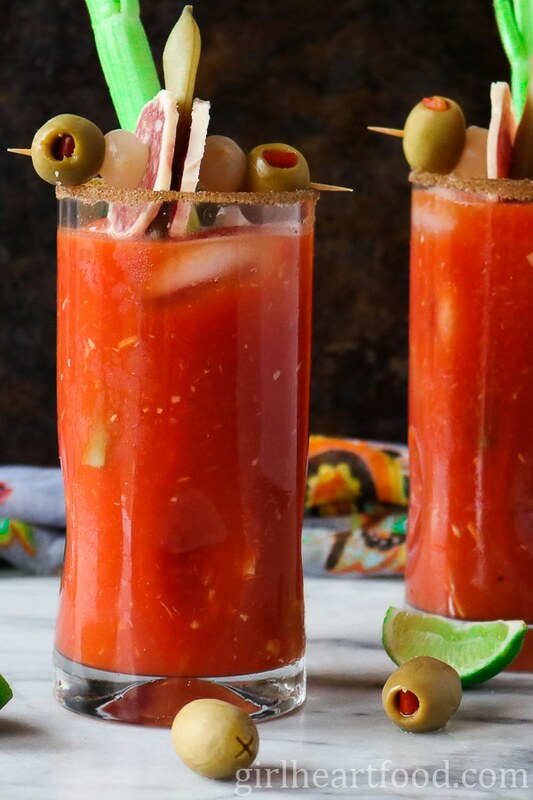 Ultimate Caesar Cocktail (Me – Girl Heart Food) – Spicy, savoury and it comes with a little snack! This one is made for brunchin’. Gin and Blood Orange Mimosa from The Flavor Bender (pictured below & photo credit) – Made with only 5 ingredients (and that includes ice), this is one eye-catching cocktail worthy of a Mother’s day celebration! Strawberry Sauvignon Blanc Cocktail from Platings and Pairings (pictured below & photo credit) – This one is such a pretty hue and tasty to boot! Gluten Free Lemon Curd Tart with Berries from Flavour and Savour (pictured below & photo credit) – this tart is not only beautiful, but naturally sweetened. And lemon? LOVE IT! Blueberry Croissant Bread Pudding with Blueberry Sauce from The Beach House Kitchen (pictured below & photo credit) – Croissants with blueberry and almonds?! What a dish! Strawberry Shortcake and Lemon Curd Parfait from The Rising Spoon (pictured below & photo credit) – Pretty individual desserts are always a good idea if you ask me! Old Fashioned Cream Puffs with Pastry Cream from A Farm Girl’s Kitchen (pictured below & photo credit) – Always enjoy a good old fashioned dessert and this one would go over so well with lots and lots of coffee. Glazed Grapefruit Bundt Cake from Nourish and Fete (pictured below & photo credit) – With lots of grapefruit juice and zest, this one is sure to please! Quick Raspberry and Almond Croissants from Kitchen Sanctuary (pictured below & photo credit) – I don’t think I’ve ever met a croissant I didn’t like….cause butter. But, then add almond and raspberry to the party? YUM! Tangerine IPA and Meyer Lemon Curd Meringue Nests from Beer Girl Cooks (pictured below & photo credit) – How cute are these little meringues? I’m always a sucker for lemon curd too! Cinnamon Cream Cheese Rolls Ups from Ciao Chow Bambina (pictured below & photo credit) – Made with only 6 simple ingredients, they are a delicious treat for brunchin’. Lemon Cardamom Pancakes from Natalie’s Heath (pictured below & photo credit) – Pancakes are definitely a brunch staple! The combo here is just lovely too. Gluten Free Quiche with a Hash Brown Crust from Joy Food Sunshine (pictured below & photo credit) -I absolutely love the hash brown crust on this one! Such a yummy mix up from your standard pastry crust. 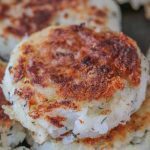 Easy Crab Cakes from Pinch and Swirl (pictured below & photo credit) – Talk about indulgence with this crab cakes! Totally fitting for celebrating Mother’s Day! Goat Cheese Brie Souffle from Tasty Ever After (pictured below & photo credit) – Who doesn’t love a fluffy, cheesy souffle? What a treat to have one of these placed in front of you! Black Forest Ham and Cheese Cups from A Fork’s Tale (pictured below & photo credit) – A little bit of everything all in these single serving cups! Love how the ham is the ‘plate’. Dill Hollandaise Eggs Benedict, Two Ways from Sugar Love Spices (pictured below & photo credit) – I could put hollandaise on everything – so so good! Love the options here with this one, a mushroom eggs benny and bacon one. Why have to pick one, though…maybe have both 😉 ? Bagels and Lox from Champagne Tastes (pictured below & photo credit) – Definitely an iconic brunch dish! Arrange on a platter and let guests build their own! Cheesy Tex Mex Frittata from me (Girl Heart Food) – Chorizo, black beans, pepper and a whole lotta flavour, this one is filling and easy to prepare! Asparagus Salad from Taste and See (pictured below & photo credit) – Using fresh spring produce (like asparagus) and perfectly cooked eggs, you have yourself one beautiful salad that could be the centrepiece of your brunch table. Strawberry Spring Salad from The Kitchen Girl (pictured below & photo credit) – Love the savoury and sweet components of this beautiful salad! Plus, super pretty! Whether you are celebrating Mom or that special lady in your life (or enjoying the day with fur baby like me), hope you find something here you’d love to make and share this Mother’s day! So many lovely brunch possibilities! Brunch is my favourite meal to eat and host, so I love all the different options in this post! And now that I’m older too, I can totally understand your mom’s request for time! There is never enough of it! Have a great weekend Dawn! Love brunch too, even more so in recent years. So true – never enough time, that’s why we should try to enjoy every moment, right 😉 Thanks Leanne! Hope you had an awesome weekend too! As a mom (but even before that) I can totally relate to what your mom is saying. So wise and so true. Nothing is more vital than time and nothing is more precious than timing. And your timing here with all this fabulous food is just right:) Beautiful spread! Have a great weekend and hopefully you get to spend a lot of time with your mom! Thank you very much Natalie 🙂 I know what ya mean! Making things off this roundup is a sure way to spoil Mom rotten! They all look delicious! Enjoy a relaxing Mother’s Day with your fur babies, Dawn! Hahaha….round ups tend to do that 😉 I love the idea of a practice round, lol. Have a great weekend, David! This would be one heck of a meal! Everything here looks sooooo good! I won’t see my mom on Mother’s Day but I think the next time I’m up there I’ll revisit this post and make her brunch :). Have a great weekend, Dawn! Such an awesome list of Mother’s Day brunch ideas Dawn! Thanks so much for including mine! I’ll need to work my way through the entire list all summer long! Happy weekend love! Thanks so much for including my recipe, Dawn! What a gorgeous roundup…I’m honored to be included 🙂 Happy Mother’s Day to all! What a beautiful assortment of recipes to celebrate Mom on Mother’s Day! From festive cocktails to decadently deliciously salads – you’ve covered it all!